During the last few months I've located two of my Mum's brothers graves, traveling to Slough and Gloucester to photograph, measure and make rubbings of the gravestones. This information enables me to create knitting patterns that replicate the surface dimensions of the stones. I've almost finished George's acid yellow cosy, a nod to the graveside flowers on the day of my visit. It saddens me that my Mum is now a part of this project. In 2009 I knitted a pink cosy for the grave Mum now rests in, she joined her mother and two of her sisters. The stone was straightened and cleaned before the burial of Mum's ashes in October, so I've retaken the measurements and selected a royal blue acrylic wool for her cosy, a colour that really suited her. Haven't done much education work recently, partly the fall out from a difficult year and a need to hunker down/retain energy BUT yesterday I worked with a fantastic and receptive group at the Hepworth Wakefield. The Hepworth Wakefield and Theatre Royal Wakefield jointly offer practical sessions for teachers, teaching assistants, NQTs, artists and art organisations through the Creative Learning Network exploring creative approaches to teaching across the curriculum as well as generating new ideas that can be applied back in the classroom. We explore drawing and communication inspired by Barbara Hepworth's The Gift in galleries 4 & 5 and Alina Szapocznikow: Human Landscapes. We had the galleries to ourselves and the atmosphere was still, shadowed, spiritual somehow... The art considered belonging, place, landscape, relationships, human experience, the body, fragility, illness and loss. The group considered, reflected upon and were moved by these issues. Today I received this response, gathered from the feedback forms completed at the close of our session: colourful, engaging, thoughtful reflective, inspiring, creative, rewarding, fun, happy, relaxing, interesting, enthralling, clever, sad. The feedback also evidenced the participants felt they had the confidence to take the ideas and explore them in their own learning environments. I'm so pleased! I'm offering limited edition giclée prints on Hahnemühle paper. Scanned direct from my embroidered handkerchiefs each print is signed and in a small edition of 25. Countless hours were spent at collage honing my observation and drawing skills, but now I rarely sit and draw for the sake of drawing. I'm aware of observing the world with a drawers eye - counting, measuring, noting the space between objects, spotting interesting colour-way, tone, texture. Learning to draw changes how you look forever: inquisitive looking, sorting the world into shapes that fit together, attempting to forget what you're looking at in order to see it clearly. This Tuesday I tootled up Leytonstone High Road and attended a class with East London Life Drawing. The assembled group were focused and companionable, and we lost two hours in the best possible way: in the moment, solving the problem of how to depict a living form on 2D paper. For me, it all came together when I got my hands on this red crayon, a blunt, early years type crayon with both beautiful and frustrating qualities. My brief was to create an activity that could accommodate 300 participants a day, reference Hodgkin and Hepworth and result in something wearable within 20 minutes of making! This workshop was the result. Run during the Summer Bazaar weekend at the Hepworth Wakefield, our visitor total was 611 happy people - phew! With thanks to staff and volunteers Hilary, Lesley, Rachael and Haleema, also Sandra for help moving tables! Myself and Gillian Brent got our heads together in her Sheffield studio and invented this drop-in workshop for families in response to Howard Hodgkin: Painting India. Rain and wind meant our Outdoor Play workshop became indoor play in the bright and roomy learning studios at the gallery. We had a few utterances of 'wow' as children stepped into the space, one child calling the installation a laundry painting, which I loved! Our idea evolved from a sense of being able to walk into Hodgkin's paintings. Throughout the days, our walk-in painting altered, evolved and began again as 230+ participants pegged, tied and draped fabric, ribbons and drawings within the structure. 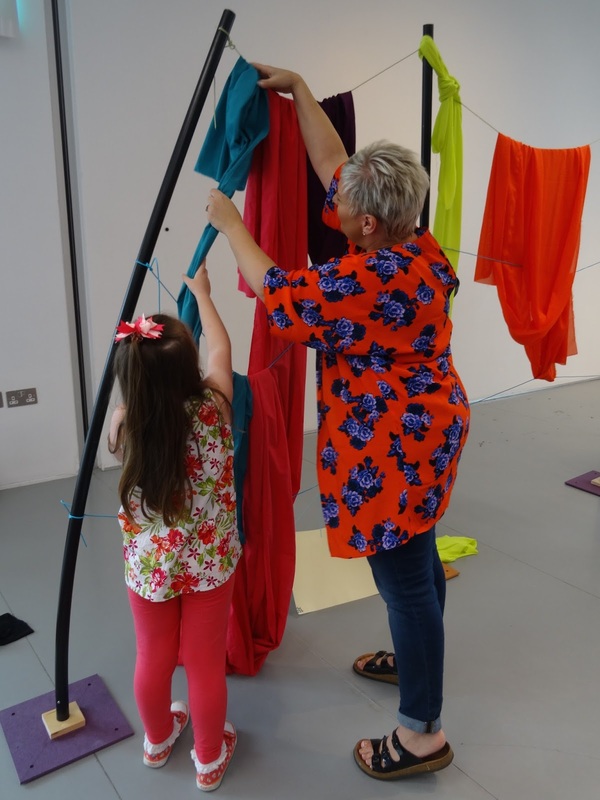 They did this after exploring the gallery using an inventive pack containing questions, prompts, ribbons, fabric, a black card frame and bags containing cloves, cardamon, cinnamon and coriander seeds - connecting scent and painting in their own personal way. As always, we couldn't do this without the support of the learning team and generous volunteers - a BIG thank you to them. 300+ participants got involved with Colourscape, inspired by Howard Hodgkin: Painting India at The Hepworth Wakefield. A weekend of outdoor drop-in workshops for families, arranging fabric and play equipment in response to Hodgkin's bold, gestural paintings. Very proud to share that The Hepworth Wakefield has won Art Fund Museum of the Year 2017. 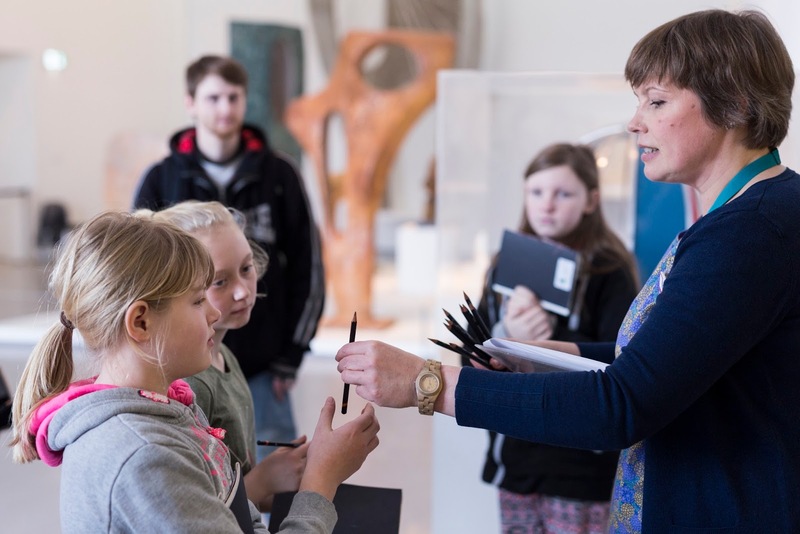 Our education team won the Clore Learning Award at the Museum of the Year Awards 2013, so it's not the first time our endeavour, commitment and excellence has been recognised. In 2010, I was living in Sheffield and looking for work. A friend mentioned a new gallery opening in Wakefield, I rang the education team and a surprised voice told me they had put a call out for creative practitioners that day! I applied and the rest is history. Nat, Vic and Ami united an amazing team of movers, writers, musicians and visual artists - working in sculpture, installation, drawing, painting, photography and textiles. We were privileged in entering the gallery before any art was installed, with mud churned up around the building. We got to understand the space, it's light, angles, scale, building as object, nestled amongst and mirroring disused factory and mill buildings. Whispering about the past and the future. The Hepworth Wakefield is deeply connected to this site, it's walls driven into the earth, The River Calder lapping against concrete, forming part of Wakefield's flood defence. Floor to ceiling windows frame the cityscape beyond, tapping you lightly on the shoulder to remind of the importance of landscape for Hepworth, her early formative experience in West Yorkshire preoccupying her life's work. Today, the Epicentre in Leytonstone was buzzing with families celebrating Story Feast, a wonderful poetry project for primary schools developed and delivered by the Discover Children's Story Centre. Families listened to and joined in with story telling, invented poems, made art and sculpture. Children created a wooly walkway into the event, some spending hours carefully interweaving, others working in joyful bursts. We joked they would receive a ball of wool for their birthdays, so absorbed were they by the process! 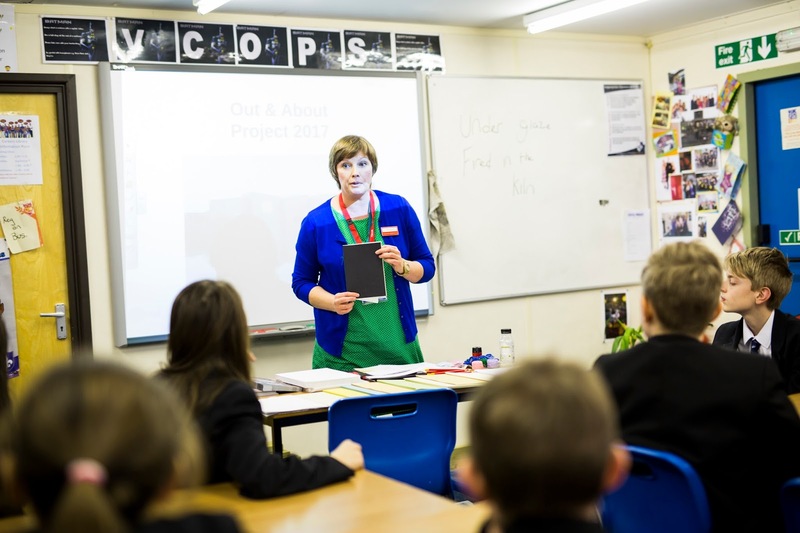 Our Out & About celebration was a chance for the three schools; Airedale Academy, De lacy Academy and Wakefield City Academy to gather in The Hepworth Wakefield learning studios and share their experiences. The studios were buzzing with gallery staff and participants friends and family. Pupils voiced project highlights, certificates were presented and we clapped and cheered! 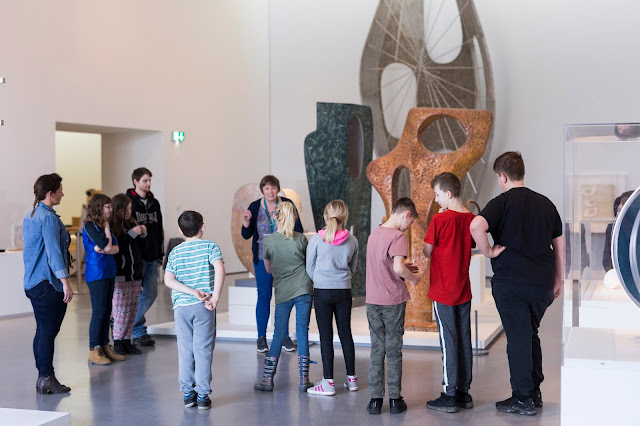 Meaningful connections are made with the schools and I hope this leads to future creative collaboration with The Hepworth Wakefield. Proud! Waiting for the schools to arrive! Very proud to share this brilliant film documenting Out & About 2017 by Nick Singleton. In an unobtrusive and sensitive way, Nick captured the mood and delight of this fantastic project - thank you! 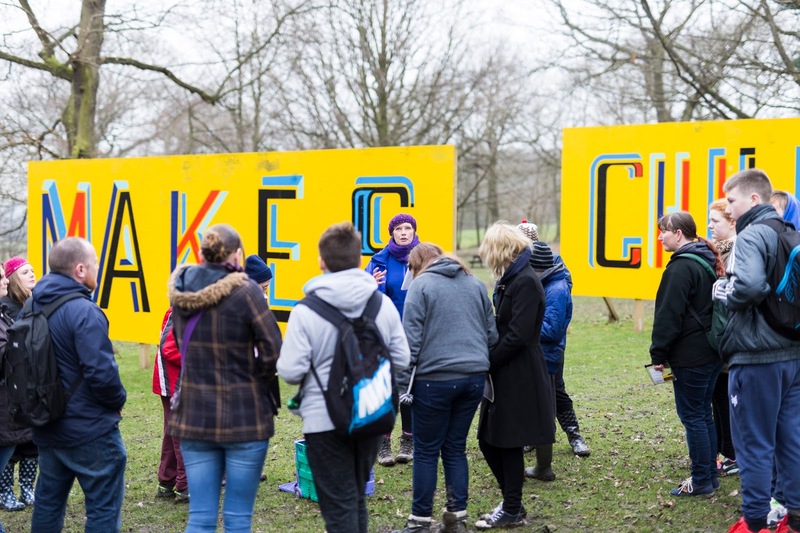 Yorkshire Sculpture Park provided the final destination for Out & About 2017, bringing together our project themes of landscape and sculpture in a phenomenal way! 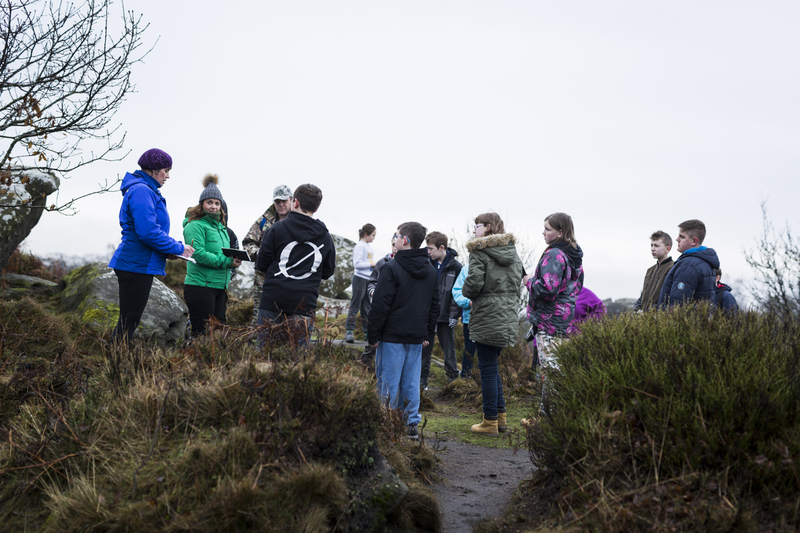 The groups explored the park, free range and self directed, linking/relating sculptures to Brimham Rocks, Hepworth and spotting designed landscape, reminiscent of Nostell Priory and Parkland amongst naturalistic views. Standing in front of Bob & Roberta Smith's, Art Makes Children Powerful we considered this statement and shared our ideas, before asking the question, 'How has this project made you powerful?' The thoughtful and heartfelt statements that followed were beyond my hopes for the project. Our last day was also the wettest of this whole adventure, and spirits were high. As the group trudged, rain soaked, towards the coach, an aunt of one of the boys turned to me with a grin and asked, 'Would you do it again? ', 'YES!' I replied without hesitation, 'I would too' came the reply, and that felt amazing! Out & About 2017 came to The Hepworth Wakefield this week, considering sculpture AND the purpose built gallery itself, sited amongst derelict mills by the River Calder. Our school groups responded to The Gift, contorting their bodies into sculptural shapes, playing drawing games, drawing from description, drawing in teams. We used the floorspace in the learning studios to spread out and add depth, tone and colour to the communal drawings with graphite, charcoal and crayon. Participants pushed themselves, tried new approaches and some displayed pride in their achievements with mark making and card sculpture. It was odd/nice to be indoors. 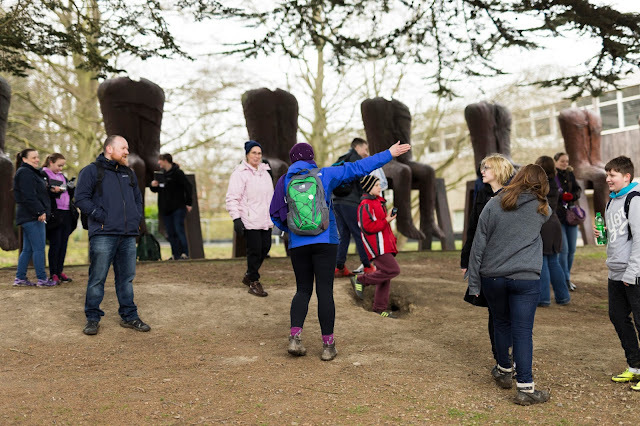 Next week Out & About travels to the Yorkshire Sculpture Park for the final adventure of this wonderful project.